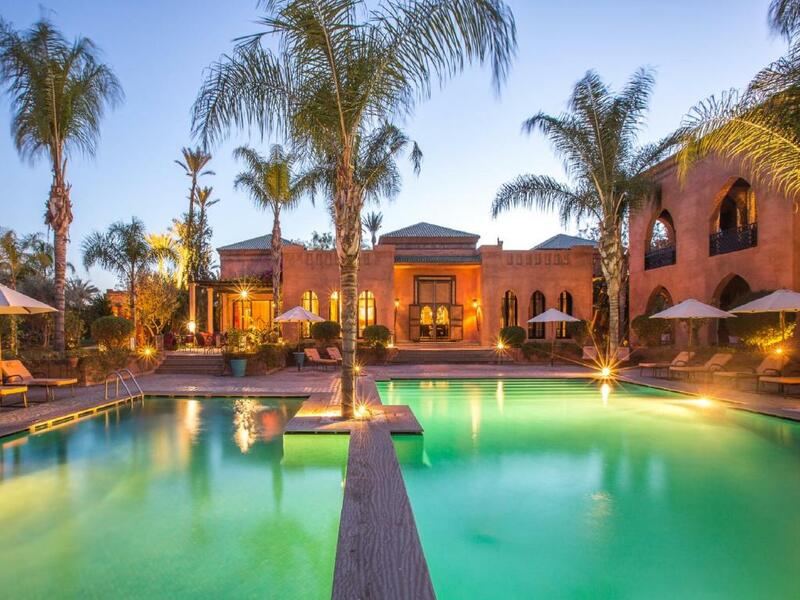 Marrakech has an exotic charm that has to be experienced to fully understand. Its winding bazaars and the truly exotic and world-famous Medina of Marrakech are truly from a bygone age and the hustle and bustle add an energy and dynamism that is invigorating to be right at the centre of. Where will you choose to stay on your Moroccan adventure? Here is a rundown of 5 of the best luxury hotels in Marrakech that are sure to make your stay unforgettable. A luxurious romantic hideaway within a walled medina of Marrakech, La Sultana is moments away from the royals palaces, museums and souks of this magical city. This is a small, luxury hotel that knows how to spoil its guests, especially in the spa. From almonds to dates, prickly pears to Damask roses, the alchemist-like therapists make the most of Morocco’s natural treasures. There’s a Jacuzzi, two hammams and sauna here too – not to mention candlelit pools. Each of La Sultana’s evocatively named Riad houses retains their own identity, but share an attention to outstanding craftsmanship that is a celebration of Moroccan artisan creativity. Think intricately carved cedar wood ceilings and beams, ornamental plasterwork, striking tiles and extravagant lamps – but without the pastiche or cliché of themed interiors. Here’s a hotel dripping with luxury where you can enjoy the stunning La Jardin with its verdant olive and palm groves providing pleasant shade and seclusion in and around the pool area and bespoke pavilions. Guests may also enjoy exclusive spa treatments that promise to rejuvenate the skin and prepare it for an enviable tan under the Moroccan sun. Night time dining is a delight, too, and you have 3 restaurants from which to choose your gourmet dining experience. 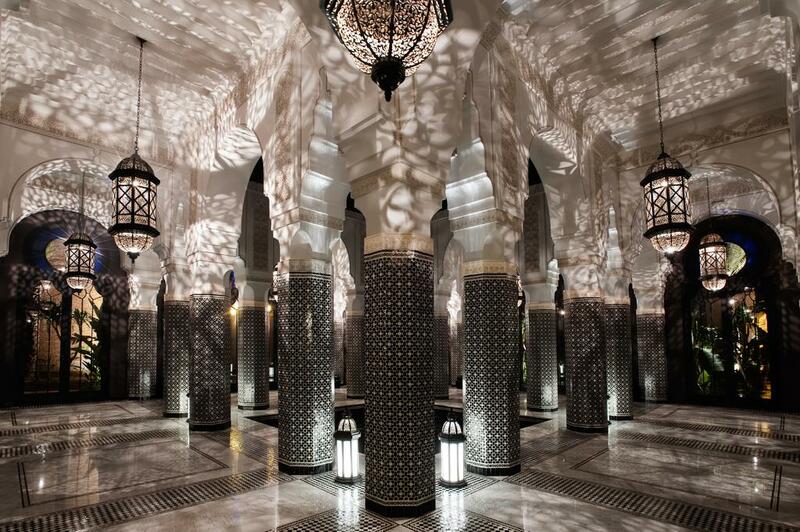 The Royal Mansour truly has a touch of oriental magic to it that you will not forget in a hurry. 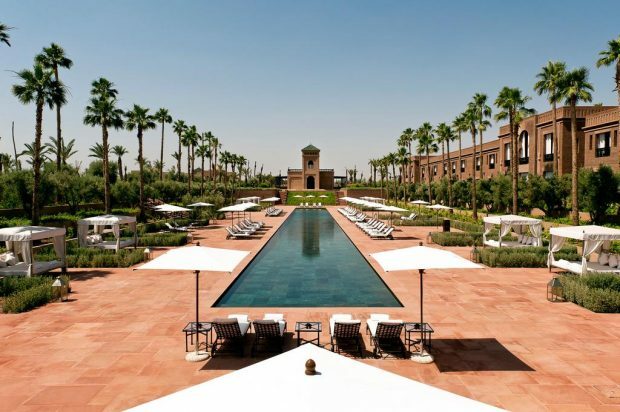 Whether it’s enjoying the exquisite Quiet Pool and nearby poolside under shady palm trees or enjoying the delights of the Moroccan spa where you can bathe and enjoy the best exfoliating treatments and exotic oils, the Four Seasons is the perfect place to base yourself while exploring Marrakech and beyond. Rooms come with garden and pool views and offer the ultimate in relaxation, replete with Moroccan decor, delightful handcrafts and marble bathrooms. Rooms also offer a recessed balcony presenting the perfect way to unwind with a good book during the heat of the day. Others have large terraces enabling you to enjoy the ultimate in al fresco dining. Gaze up at the splendour of the Atlas Mountains as you enjoy relaxing amid the olive groves and fragrant gardens or even from your own luxury room. Within easy reach of the city and its main attractions such as the world-famous Medina and in laying close proximity to the Atlas Mountains, while at the same time being only 15 minutes drive from the airport, the Mandarin is perfectly situated to enjoy both the delights of the city and nature’s craftsmanship. 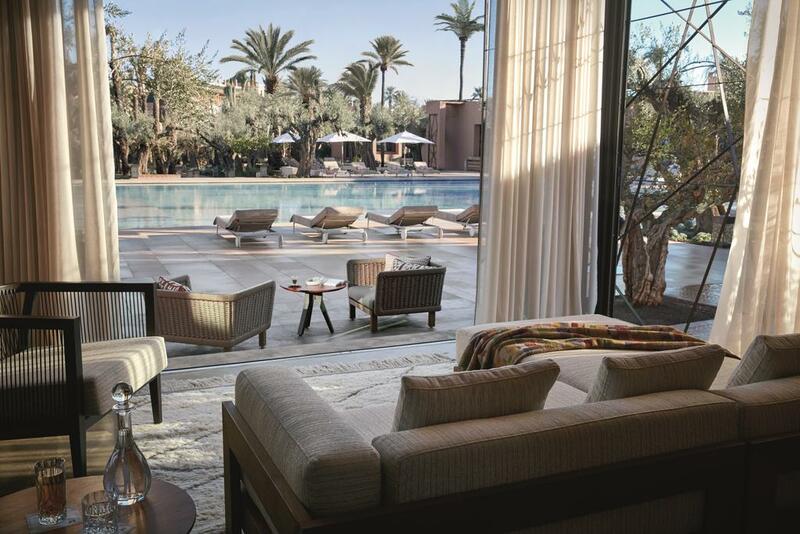 Undoubtedly the Mandarin Oriental offers the perfect respite for those travelling to Marrakech. The hotel is composed of 54 luxurious villas and 9 delightful suites offering an ideal sanctuary where you can enjoy exotic foods served by top chefs offering a delightful array of dishes celebrating the gastronomic heritage of Morocco. Enjoy a relaxing afternoon in the Pool Garden Restaurant offering mouth-watering dishes sourced locally as well as appealing to those seeking a Mediterranean style diet while also offering exotic flavours from farther afield. This luxury retreat has the unmistakable touch of master craftsmen everywhere with ornate patios, gloriously spacious rooms, silk sofas and classy embroidered curtains all working together to create a magical experience. With rooms decked out in finest Moroccan artwork, gossamer curtains, cedarwood screens and marble bathrooms, you will be left feeling you’re in the lap of luxury while staying at the Riad. The courtyard is a delightful place to dine in true Moroccan style as evening descends. Try the sumptuous multiple course evening spread while being serenaded by the haunting music of the desert. Situated in one of the Medina’s main gates, the Riad is ideally located to get the most out of Marrakech. Situated at the foot of the Atlas Mountains the Selman oozes luxury at every turn with grandiose chandeliers and Arabian decor fit for royalty. During the day you can simply unwind by the impressively huge 80 metre pool seeking shade under sleepy palms. The Selman also offers spacious villas for further privacy replete with their own private pools. The 3 restaurants, the Le Selman, the La Pavilion and Assys offer something for all pallets from fine dining to Mediterranean to classical Moroccan style. Eating in the Pavillion affords views of the hotel’s delightful Arabian horses that truly complete the look of all things romantic and oriental. For the ultimate in relaxation, avail yourself of the hotel’s luxury spa facilities that will truly rejuvenate you during your stay. 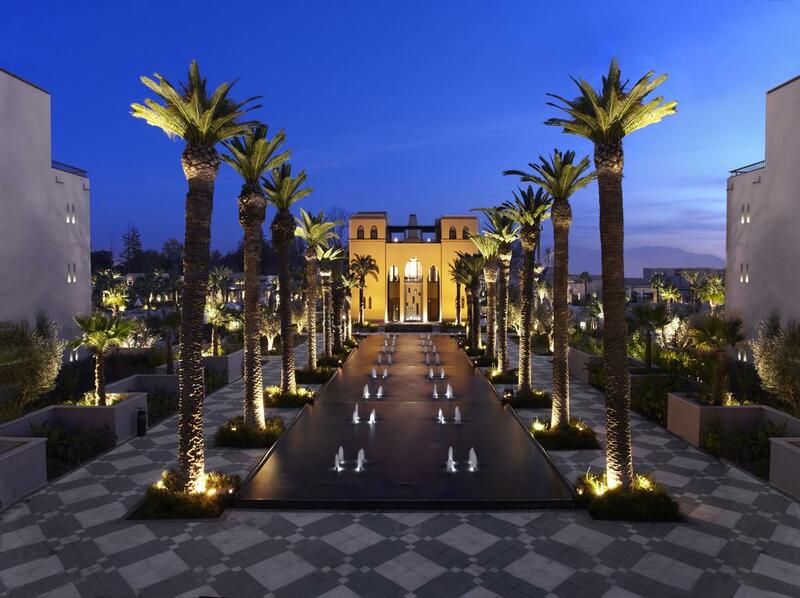 Whilst being located a little out of the centre of Marrakech the Palais Aziza is set amongst a tranquil and exclusive palm grove. If you prefer to wake to the sounds of nature in a leafy suburb and not the hubbub of the medina, this hotel is for you. 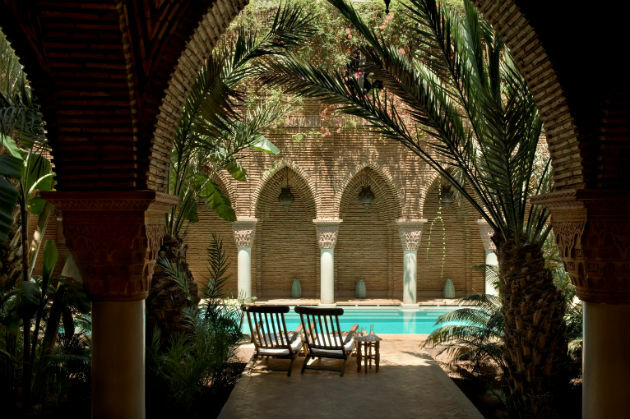 Traditional in décor, the Palais Aziza boasts beautiful Zellige tiles, sparkling water features, handcrafted lanterns dotted about the place and Moorish arches aplenty. Rooms are spacious, elegant but unfussy, many with doors opening onto the interior courtyard. The suites, which are separate to the main building, are slightly more opulent with vaulted ceilings and their own private gardens. The hotel’s main restaurant, Maroliano, serves up a fusion of Moroccan and Italian dishes in a romantic setting. Guests can also enjoy al fresco dining throughout the day and drinks in the traditional Moroccan Salon. The spa, whilst not huge, is appropriately kitted out with all the facilities you need for a relaxing experience and the skilled team will ensure you are the best version of yourself. 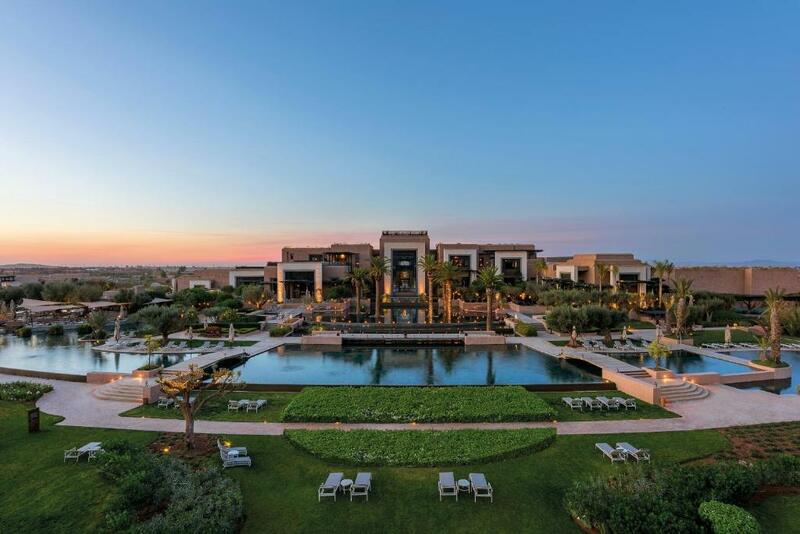 Nestled in a vast estate of 231 hectares of palm, olive and orange trees with the Atlas Mountains offering a postcard backdrop, the Fairmont Royal Palm Marrakech is an oasis of luxury only 20 minutes from the heart of the city. The sprawling resort and country club offers anything a guest could desire, with an 18-hole golf course, a choice of six restaurants and bars, a huge lake-like swimming pool, and an incredible spa plus kid’s club and fitness centre, you won’t ever need to leave the hotel! 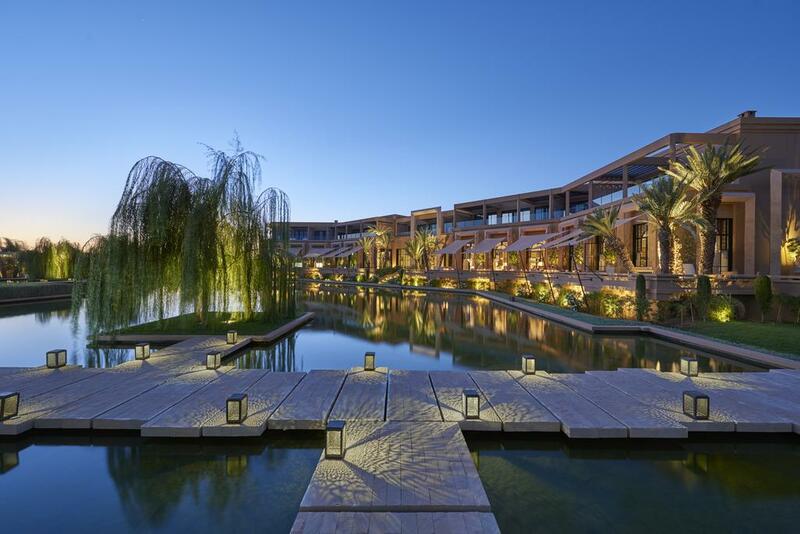 The hotel’s architecture mirrors the ksars of the Southern desert regions. The interior décor is equally stunning with an abundance of huge picture windows showcasing the landscaped gardens beautifully. In rooms, a mix of warming, tonal textures and textiles have been used to create a contemporary interpretation of Moroccan style. Cuisine hasn’t been overlooked here either. Breakfast on the terrace of Le Caravane overlooking the pools and gardens, before trying L’Olivier for al Fresco lunch by the pool. The evening calls of the opulent Al Ain restaurant for a Moroccan feast before finishing your day in the jazz bar for some delectable cocktails.